Baked Brie with sweet red pepper jam. In a medium saucepan, heat the olive oil over medium heat. Add the red bell peppers and season with salt and black pepper. Cook until the peppers are tender, about 6 minutes. Stir in the vinegar, sugar, honey and mustard seeds. Bring to a slight boil and then reduce the heat to simmer. Simmer for 20-25 minutes or until thickened and most of the liquid has evaporated. Remove from heat and let stand at room temperature until you are ready to serve, or place it in a jar and seal tightly. Place in the fridge where it will keep for about 2 weeks. Preheat your oven to 375 degrees F and spray a baking dish or small cast iron pan with nonstick spray. Place the brie in the pan, and then place the pan in the oven. Bake the brie for about 15 minutes or until softened. Remove from heat and immediately dollop with red pepper jam. Garnish with toasted pine nuts and fresh parsley. 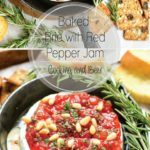 Enjoy immediately with crostini, crackers or pita bread.